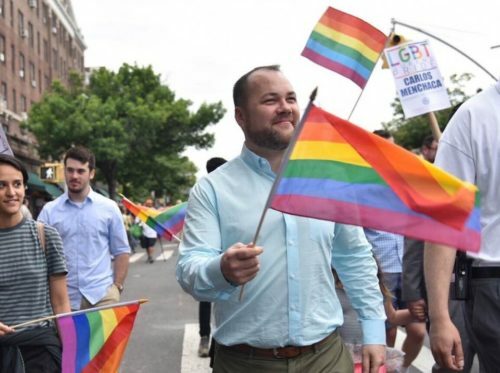 City council member Corey Johnson is set to be elected Speaker after New York City Mayor Bill de Blasio backed an intra-party deal, the New York Daily News is reporting. Johnson, a Democrat who represents several Manhattan neighborhoods, got backing on Wednesday from Queens and Bronx County Democratic leaders to head the City Council. Manhattan’s party leader already backed Johnson, giving him enough votes to win. He will replace Speaker Melissa Mark-Viverito, who is leaving the City Council because of term limits. In 2000, Johnson made headlines when he came out as the co-captain of his high school football team in Massachusetts, and his story was reported in The New York Times and on 20/20. In 2013, when he was the chair of the Manhattan Community Board, he ran for the City Council seat left open by Christine Quinn, who was leaving due to term limits. During the race, he came out in a New York Times interview as HIV-positive. Johnson won, and since becoming a city council member he has passed eighteen pieces of legislation, including a bill that ended the surgery requirement for transgender people who wanted to correct their birth certificate in New York City. This made it easier for trans people to update other documents. “Without these documents, transgender people are left to present incorrect ID, becoming subject to harassment, discrimination, accusations of fraud, and oftentimes being turned away from receiving vital public services,” Johnson said. Last year, Johnson proposed legislation that would have required “certain executives of organizations who are named in the entities holding City concessions” – like Donald Trump – to release their personal income tax returns. Even though he’s gay and HIV-positive, some noted that his election will show the lack of diversity in city leadership as three out of four citywide officials will be white. Johnson has not commented on his expected win.